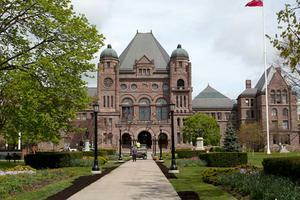 Marsh, James H.. "Toronto Feature: Legislative Assembly of Ontario (en anglais seulement)". The Canadian Encyclopedia, 02 juillet 2015, Historica Canada. https://www.thecanadianencyclopedia.ca/fr/article/toronto-feature-legislative-assembly-of-ontario-en-anglais-seulement. Accessed 21 avril 2019. 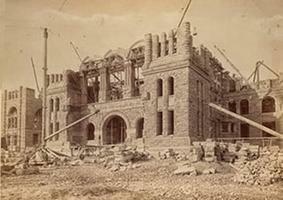 In 1880 an international competition was held to design the new Ontario Legislature Buildings to be located on University of Toronto land in Queen's Park. Toronto has been the capital of first Upper Canada and then Ontario since 1793 and these are the fourth parliament buildings. Thirteen architects entered: 7 Canadians and 6 Americans. 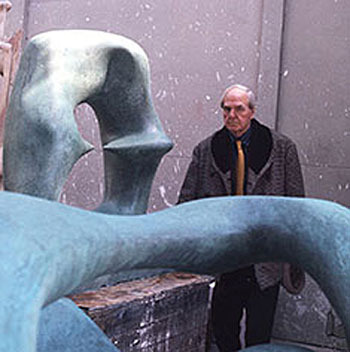 The jury of 3 included R.A. Waite, an English architect living in Buffalo, NY. 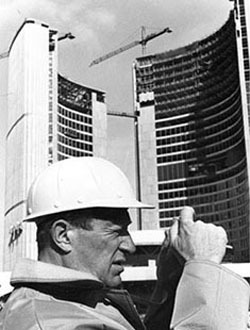 Unhappy with the projected budgets, the province let the project lapse until 1885, when they asked Mr. Waite to decide between the 2 lowest bids. Waite, who had spent the intervening years ingratiating himself as a poker player with government officials, proclaimed that neither design was suitable and pronounced that he was "the only architect on this continent capable of carrying out such an important work." His bid was even higher and eventually cost twice the amount of his rivals. The main block of the massive Romanesque Revival structure, with its towering legislative chamber, was completed in 1892. 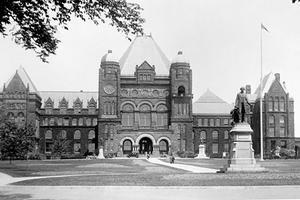 On 4 April 1893, Premier Sir Oliver Mowat opened the first legislative session.